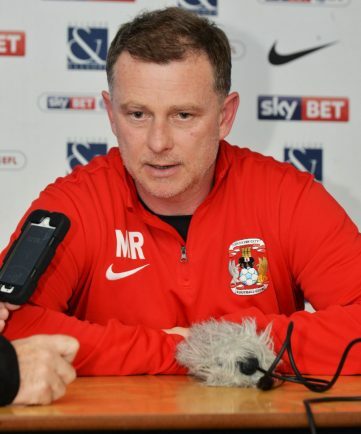 FOOTBALL: MARK Robins feels his depleted Sky Blues side failed to deal with Rochdale’s power as the new City boss tasted a fifth league defeat since returning for a second spell in charge. Skipper Ian Henderson scored a goal in either half to secure a 2-0 victory for Rochdale at Spotland Stadium on Easter Monday. And Robins feels injuries took their toll on his young squad who now have two games remaining against Walsall and Scunthorpe. “It was always going to be interesting to see what reaction and what performance levels we were going to get out of the players. “We’ve had to make changes through injury, lost a couple more today. Ben has come off with his neck, I don’t know the extent of it. “I think Rochdale are a good side, Ian Henderson typifies what is good about them. We were short in the defensive department first-half, disjointed performance, but not unexpected with the changes we’ve made. “Their midfielders know the game, they can mix it, play when they need to. It is two games from the end of the season, I want to get on with the job.